Radulski, Corinne (Amerena) of Arlington, formerly of Winthrop and Belmont. October 27th at 84 years old. Beloved wife of 61 years to Chet Radulski. Cherished mother to Mark Radulski and his wife Christine of Sudbury. Devoted Nana to Caroline, Michael and Matthew Radulski. She is the daughter of the late Richard and Mary (Dente) Amerena. Corinne was a person of devout faith, actively involved in her church as a Eucharistic Minister and was part of the choir at St. Camillus Church. She was a member of the Maria Montessori Lodge and the Arlington Catholic Women’s Club. She had many interests including tennis, golf, bowling and dancing. Her greatest joy was her family. Funeral from the DeVito Funeral Home 1145 Mass., Arlington on Wednesday at 9 am with a funeral mass to be held at 10 am in St. Camillus Church. Burial to follow in St. Paul Cemetery. Relatives and friends are invited to visit in the funeral home on Tuesday from 4 - 7pm. Donations can be made in memory of Corinne to one of her favorite charities; The Red Cloud Indian School, 100 Mission Dr., Pine Ridge, SD 57770. 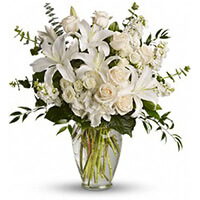 To send flowers to the family of Corinne F. Radulski, please visit our Heartfelt Sympathies Store. We encourage you to share any memorable photos or stories about Corinne. All tributes placed on and purchased through this memorial website will remain on in perpetuity for future generations. My deepest condolences to the friends and family of Ms Corinne. Death is so painful and we will never get used to losing our love ones in death and. The reason is because we were created with everlasting life in view. (Ecclesiastes 3: 11) To learn more, please visit jw.org and view the faith strengthening Video: What is the condition of the Dead.